Mark Alexander shines in Scotland, Linda Petticrew claims a podium spot in Parakanaur, Tara Agnew is second lady in Antrim and the Pure Running Half Marathon series kicks-off. A five-strong contingent from Ballymena Runners travelled to the outskirts of Edinburgh for the tough and iconic Carnethy 5 Mountain Race, hosted by highly respected Scottish club Carnethy Hill Running Club. It was a successful outing for the quintet, none moreso than Mark Alexander who was first Overseas Runner at the event, coming home in 1:06:01 to collect the Abernethy Quaich Trophy. Also competing were Jack McKenna (1.11.17), Gillian Wasson (1:11:34), Tim Lowry (1:14:54) and Alastair Hill (1:28:02). Another five runners travelled to the Quays Shopping Centre in Newry for the DUNE Half Marathon. The cross border event, ending in Dundalk's Market Square, kicked off the 2018 Pure Running Half Marathon series and was run in tough, wintery conditions. John Robinson was the first Ballymena runner to finish, claiming 33rd spot in 1:26:18, just ahead of Rodney Agnew and John Hasson who crossed the line together barely three seconds later. Aine Hasson and Paul Cupples also represented the club, recording times of 1:48:48 and 2:07:42 respectively. The Sperrin Harriers Winter League Trail series concluded on Saturday with a ten-mile race aound Parkanaur Forest. The route comprised of three laps of the trail around the forest, taking athletes past the stately Parkanaur House and its gardens and along the Torrent River. 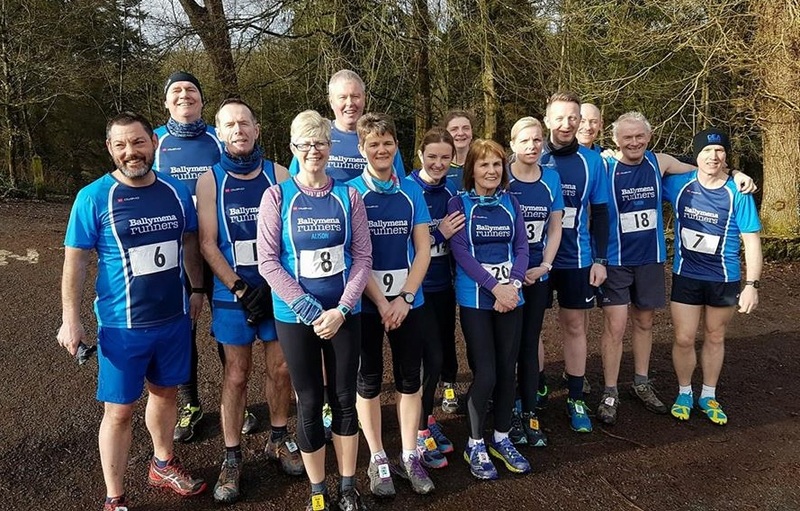 Fourteen Ballymena Runners journey to the outskirts of Castlecaulfield for the event, with Paul Connolly leading the way in 18th place overall in 1:10:16, followed by Neil Purvis (47th; 1:19:20) and Linda Petticrew (48th; 1:19:30). Indeed, Linda finished 5th lady overall to claim a podium spot for the first time as well as winning her age category. Naomi Hutchinson finished 60th (1:22:58), then came Glenn McGall (69th; 1:23:55), Alison Foster (72nd; 1:25:11), Alastair Donaghy (77th; 1:26:24), Robin Alexander (83rd; 1:27:16), Stephanie Johnston (91st; 1:31:40), Jonathan Johnston (95th; 1:33:27), Harry Armstrong (100th; 1:39:54), Brigid Quinn (103rd; 1:47:07), Terry Foley (107th; 1:49:34) and Bernadette Rose Carmichael (113th; 2:04:14).